1. Microcomputer and digital scanning converter are designed for this kind of scanner, and its images are very clear, stable and high-resolution. 2. All of B, B+B, B+M, and M display modes are available and 256 grayscale is employed. 3. Its real-time images can be frozen and amplified, as well as reversed up and down, left and right, and black and white. 4. Built-in pseudo-color processing module and standard PAL-D and VGA video output are optional. 5. It can be connected with many other kinds of equipment, such as large-screen monitor, color displayer, videocassette recorder, video image printer, etc. 6. The adoption of transformer switch power supply without frequency power, programmable parts, and surface mounting technology makes this trolley ultrasound scanner highly automatic, small in size and light in weight. 1. It can be used in diagnosing various kinds of tumors, like malignant tumor (extrahepatic growing, inverted), and intestinal tumor (colon cancer, rectal cancer). 2. It can be applied to scanner inflammation and ulcer, such as chronic gastritis, menetrier, gastric ulcer and duodenal ulcer. 3. This PL-2018CII trolley ultrasound scanner is suitable for diagnosis of congenital abnormality of gastrointestinal tract, like congenital pyloric stenosis and gestrointestinal double malformation. 4. It can also be used in diagnosing of acute gastrectasis, gastric execise dysfunction; gastric foreign body; gastroptosis, and general examination of liver, gallbladder, spleen, pancreas, urinary system, etc. 11. Obstetric table: BPD; CRL; GS; FL; AC; HC; FW; EDD. 12. 10 different kinds of body marks with probe position are designed. 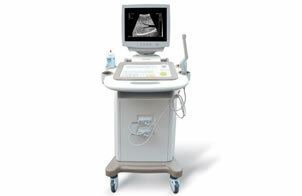 We are a professional manufacturer and supplier of trolley ultrasound scanner with two probes in china. This trolley ultrasound scanner with two probes is suitable for diagnosis of congenital abnormality of gastrointestinal tract, like congenital pyloric stenosis and gestrointestinal double malformation. We can also provide our clients around the world with many other products including veterinary ultrasound scanner, 3D ultrasound scanner, laptop ultrasound scanner, etc. We have obtained ISO and CE certification, and we also offer OEM service. Our products have been well received by customers from many countries, such as Syria, Kazakhstan, Kyrgyzstan, India, Pakistan, Iran, Vietnam, Indonesia, Britain, Germany, Italy, Sweden, Romania, South Africa, Egypt, Ecuador, Uganda, Bolivia, Paraguay, Uruguay, Mexico, the United States, Canada, Argentina, Peru, etc. If you're interested in any of our products, please don't hesitate to contact us freely. 1. High-precision digital imaging technology is employed to make its display more real and clear. 1. The use of high-precision digital imaging technology makes its display more real and clear.